Starting September 19th, 2016 and live each Monday for the following 8 weeks. 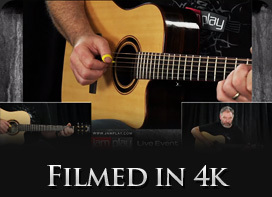 Jim Deeming delivers a much-needed live course covering fingerstyle composition... and demystifying this advanced, yet achievable style. In this eight week course you will learn how to build your own fingerstyle arrangement of a song from beginning to end. You will learn a step-by-step process for dissecting a song into the key building blocks on which an arrangement is made. Then you'll make it your own by adding all the features available in fingerstyle, laying down a groove, playing the bass, chords and melody all at the same time. From there we will look at ideas and tools you can use to craft a basic song into an interesting arrangement you'll be proud to show off. For the core of the course we'll build on a familiar song but to wrap things up, we'll take a look at composing your own song from the ground up. Get full access to this live course with a full JamPlay Membership, which includes access to all past live courses and over 5,000 on-demand lessons. Even Jim makes mistakes sometimes! In this lesson he takes a fun little lick that gives him trouble and shows how to use a metronome to diagnose and fix the problem. 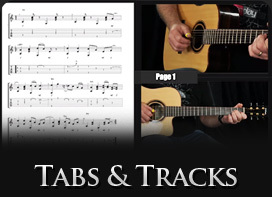 Creating fingerstyle guitar arrangements may seem complicated... but it doesn't have to be! In this lesson, Jim breaks down a basic method for approaching a popular melody. We will discuss the basic building blocks of a song and some common terminology to get you started. 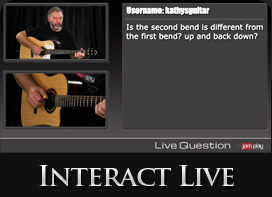 We'll also review and demonstrate each of the core fingerstyle skills you'll need for the coming weeks. This should get you up to speed! No matter what else you add, melody is what makes a song make sense. We'll start with a sample song and learn how to map it to your guitar. This important step will set the stage for the rest of the arrangement process. If the melody is the song's "story", chords are the scenic background as we go along. They are not just part of the structure - they set the tone and "color" of the song. We'll talk about how to find the chords no matter what key the song is in and how to get them put together in a way that makes sense. Now you'll put chords and melody together. In fingerstyle, you have the tools to play both at once, but caution, there are challenges ahead! This session will be totally focused on your left hand, making decisions about fingerings, choosing alternative chord positions or possibly even changing to a different key. Next we'll focus on the right hand, which is in control of the groove. You've probably heard it said, "Your left hand tells me what you know - your right hand tells me who you are". The soul, the feeling of a song is driven by your right hand fingers and thumb and this is when we'll add "life" to the arrangement. Fingerstyle lets you put lots of spices in your recipe and this week we'll look at some ways to customize your arrangement. Techniques like walking bass lines, alternate chords, syncopation and more will put the "cool" in your song and make it something you'll want to hear and play over and over again. An arrangement that's truly a finished product has more than just repeating parts. Now we'll look at crafting intros, endings and other variations you can add to really put the polish on your song. Creating your own cover arrangement is great, but what about composing your own material from the ground up? We'll wrap up this course with a look at the question, "Where do ideas come from?" You may not write an entire song but sometimes making up a bridge to drop in the middle of an arrangement is a tasty way to spice things up. We'll look at examples about how a simple idea can evolve into something bigger, even a whole song. Suddenly you're not repeating someone else's story, you're telling your own!